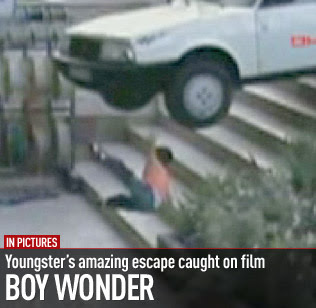 A Turkish boy has escaped unscathed after a car hit him, knocked him down a flight of steps and then nearly landed on top of him... and it was all caught on CCTV footage. I think this boy should be counting his lucky stars right about now!! The four-year-old boy has survived after the dramatic accident. He was hit by a car that had careered onto the pavement, knocking him flying down some steps. He fell to the ground, with the car almost landing on top of him, but he reportedly suffered no injuries in the accident. He was able to walk away, reportedly saying "No" when asked if he was hurt. The driver had apparently swerved to avoid a dog on the road and lost control of the car.